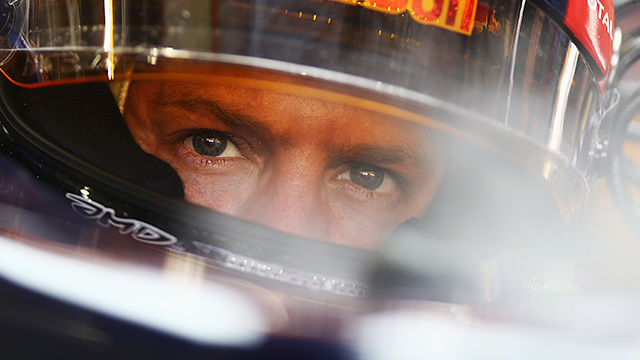 This is F1Minute - Vettel leads both Singapore Friday practice sessions. Rain hit the Marina Bay circuit ahead of Free Practice Friday but the weather cleared up in time for the sessions to run unimpeded - with just a damp track causing a slow start to the day. Drivers started on the intermediate tyres for FP1 but gradually moved over to the dry rubber, and when the times began to drop, it was Sebastian Vettel who posted the fastest time. He was followed by the McLaren drivers, Lewis Hamilton ahead of Jenson Button. The only Friday driver on the grid was Ma Qing Hua who took over Narain Karthikeyan's HRT and ended up a second and a half off his teammate, whilst Romain Grosjean made his return, finishing in 15th place. Sebastian Vettel remained on top for the second practice session in Singapore, with Button making the jump up to second behind the Red Bull. Hamilton dropped to fifth, but times don’t mean an awful lot when so many heavy fuel runs were being completed. Bruno Senna caused a red flag after he bashed the Williams car against the wall - there was no significant damage but recovering the car caused the brief stoppage period.